IMPORTANT NOTE: The purpose of the click tweets page is to make our storm effective by enabling tweeps to quickly tweet messages with one click rather than sit there drafting tweets during the storm. 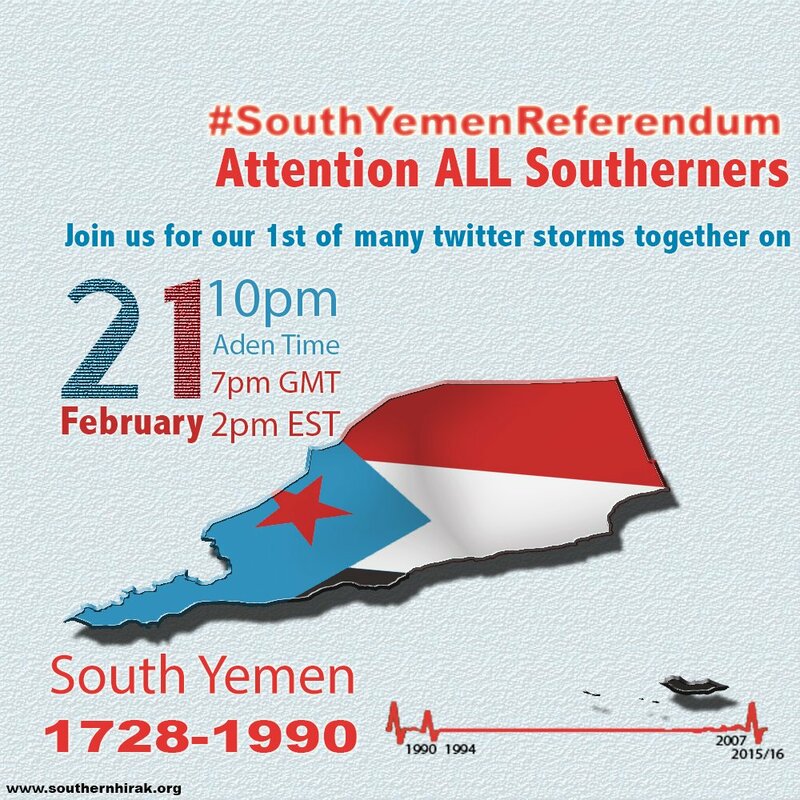 This Storm is to mark Feb 21, the day southerners refused to take part in the Yemen Republic 2011 elections. Southerners on the ground in the south will be protesting protesting for a referendum. Whilst we tweeps will be raising the awareness and gaining support for the southerners struggle for independence. 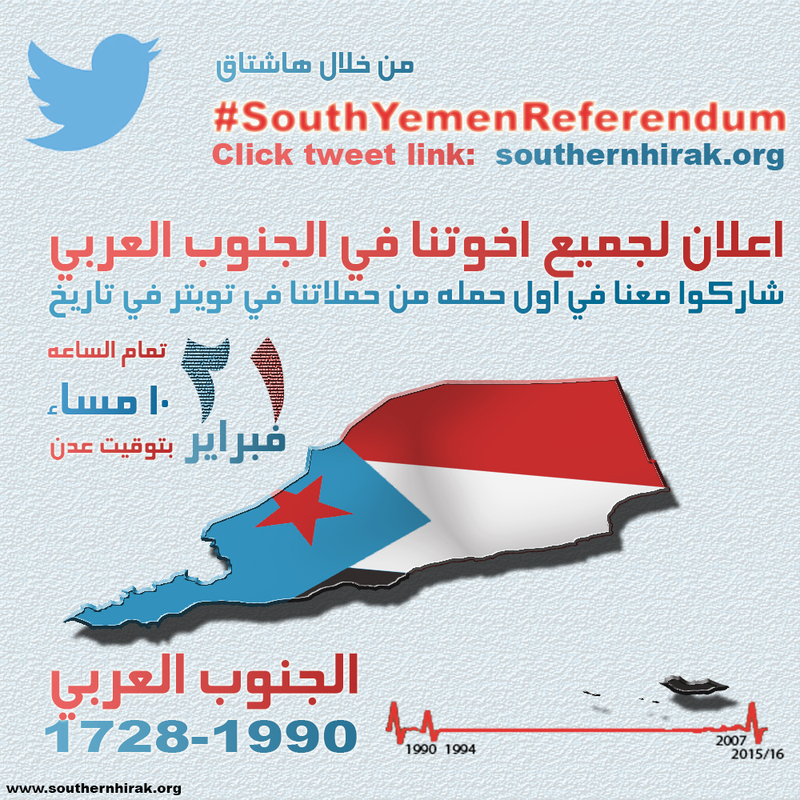 Please help us spread the message and give voice to South Yemenis who's voices have been silenced since 1994. Join our twitter campaign to ask the world to give South Yemenis their land and rights back. Help us regain our independence from a cruel occupation that has left thousands dead and millions of lives destroyed. with this and future campaigns we want to target our efforts with influence and who are unaware of southerners struggle. that is the western audiences. Hence why most tweets are in english. 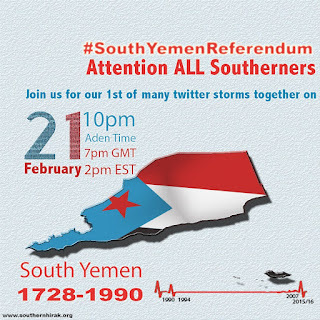 After the civil war of 1994 between North and South Yemen, South Yemen declared secession from the union and was pursuing the process for independence. North Yemen wasn't going to allow that to happen and lose all the resources it gained from uniting with South Yemen. The government of North Yemen headed by former President Ali Abdullah Saleh then forced unity on the people of South Yemen by assassinating and exiling southern leaders, occupying southern land, dismantling the southern military and firing its personal, plundering southern land and resources, and killing and imprisoning anyone who tries to speak against or shed light on the plight of South Yemen. Since 1994 South Yemen has been been systematically marginalized but most importantly silenced. In the past 20 years there was a complete media black out about the southern issue/grievances. All media and media personnel in South Yemen were owned and managed by North Yemen. Please help us spread the message and give voice to South Yemenis who's voices have been silenced since 1994. Join our twitter campaign to ask the world to give South Yemenis their land and rights back. Help us regain our independence from a cruel occupation that has left thousands dead and millions of lives destroyed.